It’s been a busy and crazy week, which is quite common lately… but I wanted to share a stool I found curbside and was asking for a change. I’m in love with everything related to the sea: compass, anchor, rope, shells, there’s nothing I don’t like! And I had been lately thinking about doing something related to it, so I thought it would be great to use for that. It wasn’t in good shape, I removed the veneer at the bottom and painted the whole thing white. Once it was all painted and fixed, I had to decide what to do. I chose to use a compass, a vintage compass to be precise. You can get the full resolution image here. The process was very simple, I transferred the image using ModPodge. If you are not familiar with this technique you can find a graphic tutorial here. Then I took some brown shoe polish and a piece of foam. I rubbed the shoe polish and tapped the borders and the legs to age it. I also tapped softly on the top. Then I applied some barnish to protect it, and it was done! What can I say, I simply love it? What do you think? Do you like it too? This entry was posted in Before & After, Transfer. and tagged Before & After, Chalk Paint, Freebies, Printables, Recycle, Transfer. Yes, Moira, I love finding things!! Ohh, Pili, I really like this one. I too love nautical things. Thanks for posting this one, it turned out really great. Have a wonderful Sunday. Pili, this stool looks so great!! You did a wonderful job! Love the compass!! Keri, thank you so much! I really love the compass too! 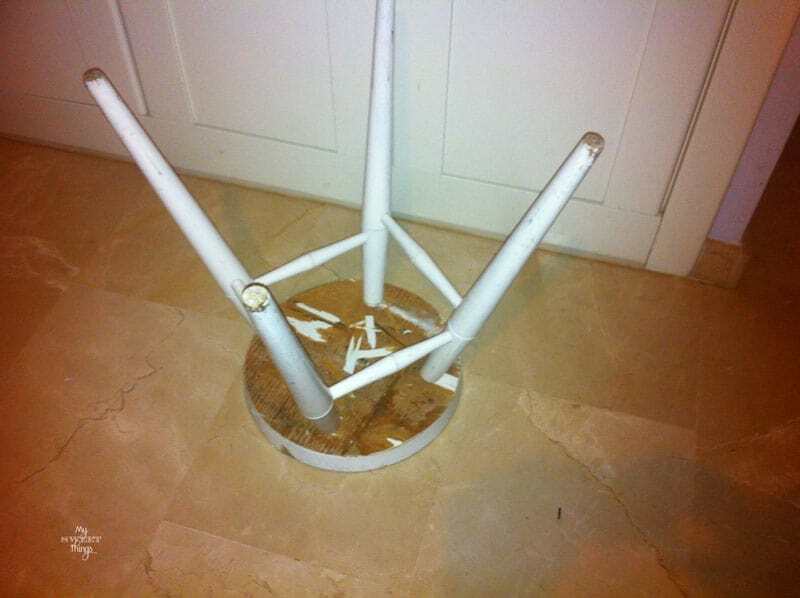 Wow you did a great job fixing up the stool and I love the compass! We love having you and hope you have a nice week. Thanks a lot, Julie. I appreciate you stopping by. Many thanks, Jess. You’re always so kind! Looks great! I like beachy stuff too and the compass is a great idea! 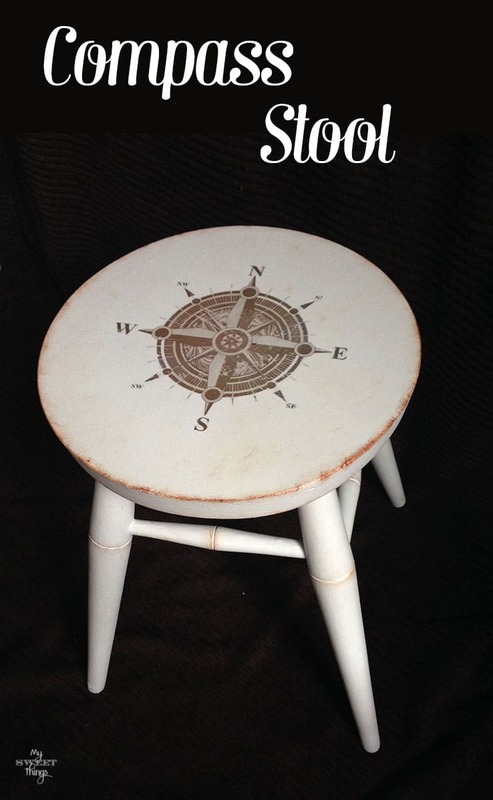 I love the look of a compass on your round stool. I’ve yet to try transfering onto wood, but may have to give it a shot after I’ve seen yours. I just usually go for the painting instead. Stopping by from Make It Pretty Monday. Hi, Carol. You can do great with paint, love what you do! Once again another fantastic DIY idea Pili! Thanks for sharing you creative ideas with us at #AnythingGoes. What will you have in store for us next week? Lots of things in my mind but little time to do them so… I’ll have to choose! What an amazing transformation! I bet if the previous owner saw it now, they would regret throwing it away! I wonder that sometimes, Catherine! I love your stool, Pili! 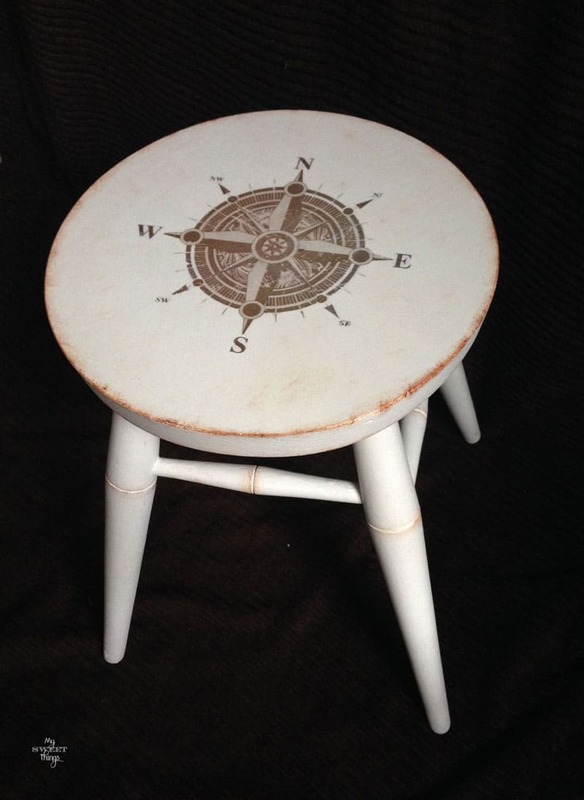 The compass is wonderful – would be perfect for a round wood top coffee table that I have. Thanks so much for the inspiration – stopping by from Welcome Home Wednesdays. Have a great day! Glad you like it, Carolyn. You can grab the high-resolution image from the link, and if you finally use it I would love to see the result! This is so cute Pili! Love the compass! Thank you so much, Wendi! Hope you’re enjoying your week! This is so nice Pili. You’ve taken something so simple and made it really unique. How creative! I like the compass idea very much. Thank you so much, Sally! I really love the compass too. Beautiful Pili! I love nautical as well, the compass is a great idea! What a cute stool ~ I want it!!! That really looks awesome. You go! That is such a cool project, Pili. And you can use it with so many patterns. I love it! Thanks for adding it to #tiptuesday. I agree, Debbie. The compass would look great wherever it’s used on. What a great little roadside rescue, love the graphic you chose. I agree Audra, the compass is such a nice and classic icon. And yes, the stool sold it in a blink of eyes! 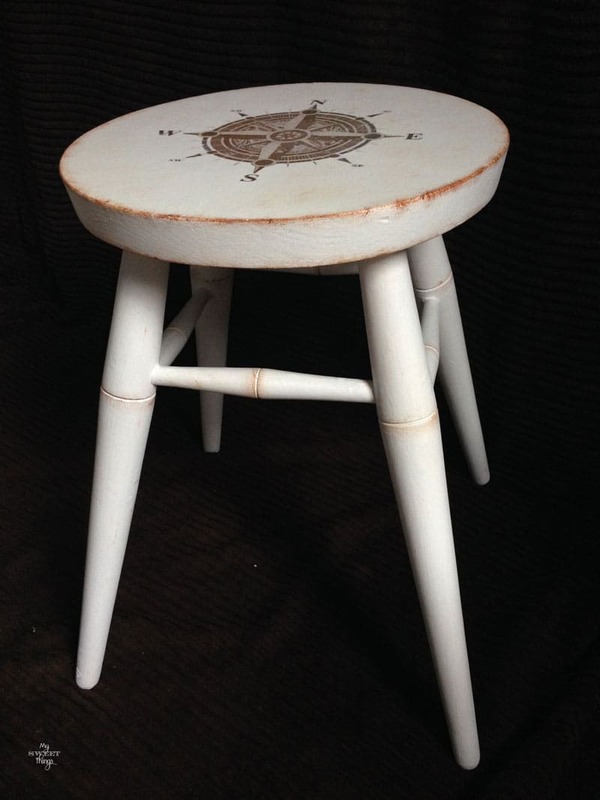 Bless your heart for rescuing this little stool and turning it into this amazing piece! Thank you for sharing at Making Broken Beautiful this week! You do lovely work! Pili, you need to have a store, I love the way you find the coolest images to transfer and create unique pieces. This stool would fit in anywhere in the home. I love how you aged it a bit with shoe polish. Perfect! Pili, first of all: nice curbside find. 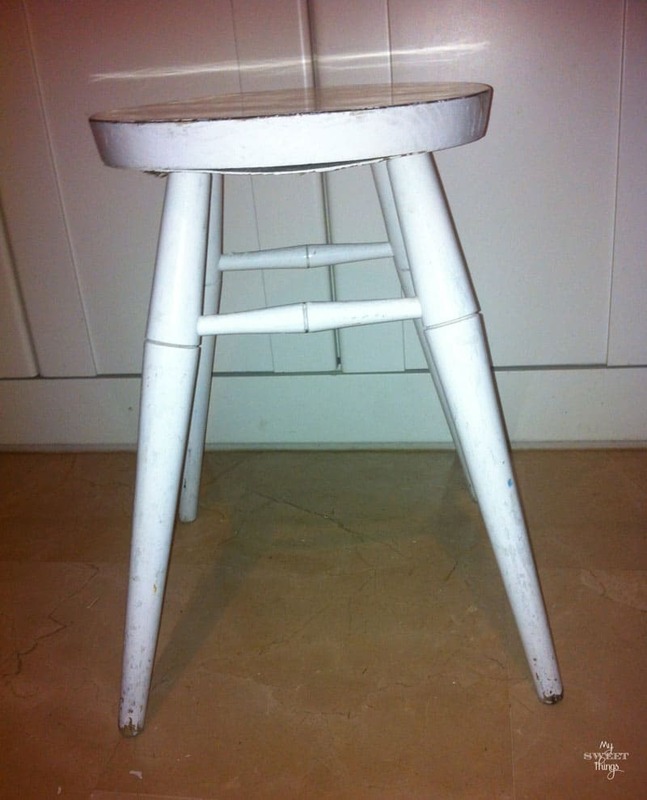 Then you turned it into such a cute stool. Not only creative but very utilitarian. That would be perfect in a nautical bathroom or bedroom. So cute! Thanks for sharing at Your Inspired Design. I’m a huge fan of nautical themes, you can’t go wrong with a compass on a nautical bathroom or bedroom. 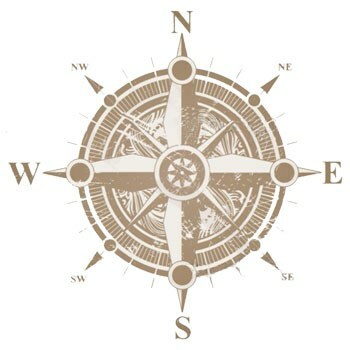 Love this vintage compass image! Thanks for sharing! Thanks for linking up at Your Inspired Design Link Party! Very cute…..Thank you for sharing with us at #JoyHopeLive! Hahaha!! You’re so funny Mimi! Thanks for the visit! You’d certainly never get lost! Looks great 🙂 Thanks for linking to #frifree4all. Sorry I’m late!! Haha, I think this post is the one that have the funniest comments!! Thanks for stopping by, Hayley!